LIMA — On the toes of an announcement by China that it may add 25 percent tariffs on agriculture products such as corn, wheat and soybeans, area farmers will have to wait to see exactly how the political fallout will affect Allen County’s economy. As of Wednesday afternoon, soybeans and corn futures took a hit from China’s tariff announcement with soybean prices dropping more than 50 cents in the morning before leveling off to around a 20 cent drop by the afternoon and corn prices decreasing by double digits before leveling to a near seven-cent drop, according to market data from the CME Group. China purchases more than 30 percent of the soybeans produced in the United States. But as markets react to the news, the long-term effects may be less significant, especially if the tariffs are prevented through further negotiations with China. “The severity of the impact is very much dependent on how long the problem drags out,” Ohio Farm Bureau Spokesman Joe Cornely said. 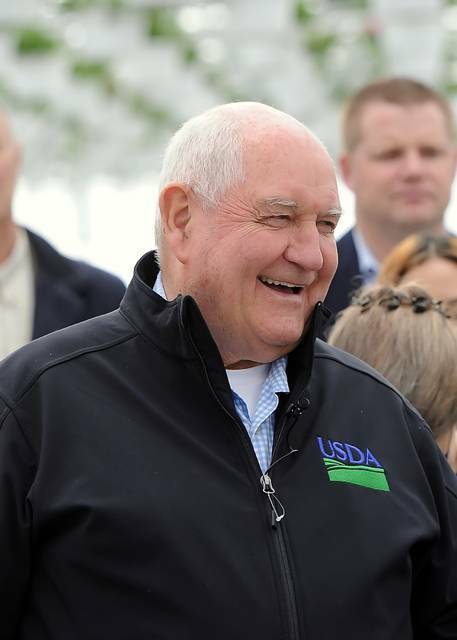 U.S. Secretary of Agriculture Sonny Perdue visited Lima as part of his “Back to Our Roots” RV Tour. During Wednesday’s event at Veterans Memorial Civic & Convention Center, he addressed the crowd about the tariff concern, replying that President Donald Trump personally told him that American farmers would not feel the brunt of a potential trade war with China. The agricultural industry is a major component of the economies of Allen, Putnam and Auglaize counties, with 207,000 acres of corn and 330,000 acres of soybeans planted within the tri-county area in 2017.